Martin Luther’s Lie of Deceit — INFANT BAPTISM! Due to the many questions concerning Luther’s teaching that infants are to be baptized, as projected in his Large and Small Catechisms; his philosophy deserves an answer from the Word of God. These questions come from sincere people who, from a child, have been raised and indoctrinated in the catechism of Luther’s philosophy. In witnessing to many Lutherans, I have found they will believe the catechism over the Bible. It appears that any teaching which contradicts their catechism is considered a cult religion. In Proverbs 118:8, the Middle Verse of the Bible is a warning to all humanity, “It is better to trust in the LORD than to put confidence in man.” (This includes Martin Luther!). May I point out that Luther had many false beliefs. He did not believe in the Rapture; nor the 70th Week of Daniel, known as the 7-Year Tribulation Period; nor the Restoration of the Nation of Israel; nor the 1,000 Year Kingdom Reign of Christ on the earth. He had a difficult time reconciling the Epistle of James with the Book of Romans; therefore, calling the Book of James, “the epistle of straw” and etc. This examination of Luther’s teachings will be confined specifically to that of INFANT Baptism. Luther says that “all nations” is inclusive of infants. Notice that this verse says to TEACH all nations. How is a person going to teach an infant the Word of God, when they can’t even walk, talk, understand or even say “goo-goo!” Now let us get the Greek word for infant. The Greek is ‘BREPHOS” and is translated “infants” in Luke 18:15, and also as “babe” in Luke 2:12,16. Will you please tell me how an INFANT can be taught, whose mind has not yet developed to the point of understanding any words? Now we are going to continue and examine the word “TEACH” and you will see for yourself how deceitful Luther really is. The Greek word for “TEACH” is the verb “matheteuo,” and means, “to make disciples.” The Greek noun for “disciple” is “MATHETES” and means, “a learner, to learn, indicating thought accompanied by endeavor. (Vine’s Greek Expository Dictionary). This is impossible with an infant. Luther knew that no infant could be taught to be a disciple, so he purposely chose to deceive you by not revealing that the Greek “MATHETEUO” means “make disciples” and should have been translated thus. If you still have any doubt about Luther’s deception; remember, he knew the Greek well as he translated it into the German Language Bible. Go back with me now in his catechism to p. 171, #619, and notice he quotes the same verse, Matthew 28:19 and puts after the word “TEACH [make disciples of].” If brought to justice, Luther would be charged with criminal deceit, found guilty by his own Catechism, and sentenced to bear the title publicly of “The Master of Deceit.” Luther had previously been injected with the “Serpent’s venom” of Catholicism, concerning infant baptism. Luther refused the antidote, the Word of God, to free himself from this damnable doctrine of baptismal regeneration of infants. Luther should have acknowledges Psalm 118:8 and Jeremiah 17:5 and obeyed what God has said. 2. Luther’s Second Lie of Deceit. Go with me now to Luther’s Small Catechism, p. 173, under B. Here are Luther’s words concerning Infant Baptism. “Because Holy Baptism is the only means whereby infants, who, too, must be born again, can ordinarily be regenerated and brought to faith.” (Martin Luther). After reading Luther’s words, allow me to ask you a very simple question. Can you pick out the LIE Luther just put forth in this statement to deceive you? What about the word Holy baptism? Do you know that “Holy” baptism is found nowhere in the Bible? God never had the Holy Spirit inspire any writer to record “Holy” baptism. Baptism is only a public testimony, outwardly showing that my faith is in the death and resurrection of Jesus Christ, who paid for my sins and assured me of everlasting life. (John 3:16, 36). The reason Luther added “Holy” to baptism was to deceive you into his philosophy, that baptism saves you. Here are Luther’s words in his Large Catechism, p. 83, #24. 3. Luther’s Third Lie of Deceit. In Luther’s support of his belief that infants are to be baptized to inherit eternal life, he quotes, Mark 10:13-15 (Luther’s Small Catechism, p. 173, #625). “And they brought YOUNG CHILDREN to him; that he should touch them: and his disciples rebuked those that brought them.” (V. 13). “But when Jesus saw it, he was much displeased, and said unto them. Suffer the LITTLE CHILDREN to come unto me, and forbid them not: for of such is the kingdom of God. (V.14). “Verily I say unto you, whosoever shall not receive the kingdom of God as a LITTLE CHILD, he shall not enter therein.” (V.15). Let us analyze these verses and see if Luther’s claim is valid, or if it is another attempt to deceive you. First, I don’t see anything in these verses that has to do with infants. The Greek word for “infants,” also translated “babe or baby” is “BREPHOS.” This Greek word appears nowhere in Mark 10:13-15. Secondly, Where does it say anything about BAPTISM in these verses? Will you show me anywhere in God’s Word where Christ ever baptized anyone, let alone babies; or, where a baby (infant) was ever baptized in the Bible. Notice in Verse 15, “Whosoever shall not receive the kingdom of God as a little child, he shall not enter therein.” A little child is capable of believing; but, not an infant! I know many, many Christian parents whose children have trusted Christ as their Savior as young as four or five years of age. No infant is capable of understanding that Jesus died on the cross and was resurrected to pay for their sins. In Verse 15, the minds of these little children had not been corrupted with the philosophy of false teachers, such as the atheists, agnostics, evolutionists, and God-haters. Therefore, their minds are free from the pollution of the false teaching of Satan’s ambassadors. Thus, when the truth of God’s Word is presented and taught to them, that Jesus loves them and paid for their sins; they simply believe it and are saved. This is the foundation they will have for the rest of their life. On the other hand, should a child grow up in a godless home, that influence may be adapted into their thinking and behavior. Of course, Satan will do all he can to insure that a person does not believe that Jesus Christ is their Savior. II Corinthians 4:3,4 bears this out. “But if our gospel be hid, it is hid to them that are lost.” (V. 3). The answer is very simple. A child’s mind is clean and free from anything that contradicts the Word of God. Therefore, the child simply believes that “...God so loved the world, that he gave his only begotten Son (Jesus Christ), that whosoever believeth in him should not perish, but have everlasting life.” (John 3:16). The child is saved. How does the older man become as a little child to inherit the kingdom of God? He changes his mind and frees it by believing the Bible to be true (just as a small child) by discarding the philosophies and ideologies of God-haters as nothing more than Satanic lies. He has now “flushed his mind clean” (as a little child) and simply believes that Jesus Christ died for him personally and rose again in payment for his sins. He is now saved as promised by John 5:24, the same as a young child. 4. It amazes me that Luther would believe and teach Infant Baptism, when it is found nowhere in the Bible. Then he uses Mark 10:13-15 as his endorsement to deceive his followers. These verses have no reference at all to infants. Neither do these verses say anything about baptism. Luther’s philosophy of Infant Baptism disintegrates when compared to the Word of God; yet, Satan has protected and projected this damnable lie for over 450 years to our present time. Today we are saturated in certain areas with “Luther’s puppets” behind the pulpit projecting Satan’s lie of Infant Baptism. Remember, all false teaching flows from the throne of Satan, who hates the Word of God. Luther is unquestionably “the Master of Deceit.” Notice the Holy Spirit’s warning in II Corinthians 11:14,15. (2). The parents brought their young children to Christ so that he would “touch” them. Why would they do this? These parents were, no doubt, part of the people Christ had previously taught and who had also witnessed people being healed by Him later near the River Jordan. (Matthew 19:1,2 and Mark 10:1, same account). They believed Christ was the Messiah, the Son of God and was soon going to be crucified, resurrected, and ascend back to Heaven. What a thrill for these children to be able to tell their children that Jesus, the Savior, had actually laid His hands on them, which was a gesture of His love for them. (Matthew 19:15). (3). In Verse 14, Jesus said concerning the children, “for of such is the kingdom of God.” In other words, these children were saved and already a part of the kingdom of God. They believed that Jesus was their Savior, because their PARENTS, who were believers, had taught them. That is why they brought their children to see Him. Take notice that there is no record anywhere in the Word of God that these children had been baptized, yet they possessed eternal life in the kingdom of God. (a). Ephesians 6:4 – Training children, not infants. (f). Psalm 78:5 – Children, not infants. None of the above references are to teach or train infants. The Greek for “infants” is not used in Ephesians 6:4 or Colossians 3:21. The Hebrew for “infant” is “OWLEL” and is absent in the above Old Testament references to teaching children, not infants. Infants are incapable of understanding or reasoning. You have a choice. 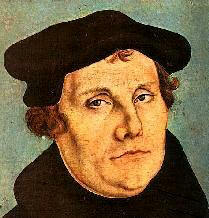 Are you going to believe the lies and deceit of Luther who has been dead for over 450 years or the Lord Jesus Christ? Christ said, “I am the way, the truth, and the life and no man cometh unto the Father but by me.” (John 14:6).